Square Post Brackets For Street Name Signs 5-1/2"
Square Post Brackets For Street Name Signs 12"
A popular post, the 10ft., 1-3/4" square sign post is made of 14 gauge steel The galvanized finish increases protection from rust & weathering. .078" (5/64") wall thickness & square shape provides excellent torsional stability, holds up to high wind loads. 7/16" holes are placed 1" on center to accept all signs we sell. 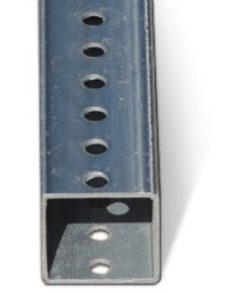 Holes run the length of post on all 4 sides allowing you to mount signs on any side at any height. 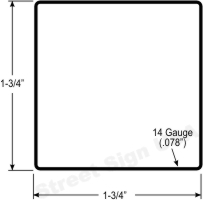 The 1-3/4" square post is top choice for all your permanent sign installations and will last for decades. Post can be used alone or with a 3ft post base to create a Break Away system as well as achieving a true 10 foot height! 2-3ft of post in ground with or without cement can suitably hold any sign 7-8ft above ground level. This oversized item ships via motor freight or courier within 3-5 business days!